^ a b c d e f g h i j k l Ruuskanen, O; Lahti, E; Jennings, LC; Murdoch, DR (2011-04-09). “Viral pneumonia”. Lancet 377 (9773): 1264–75. doi:10.1016/S0140-6736(10)61459-6. PMID 21435708. ^ a b c Lodha, R; Kabra, SK; Pandey, RM (4 June 2013). “Antibiotics for community-acquired pneumonia in children.”. The Cochrane database of systematic reviews 6: CD004874. doi:10.1002/14651858.CD004874.pub4. PMID 23733365. ^ Osler, William (1901). Principles and Practice of Medicine, 4th Edition. New York: D. Appleton and Company. pp. 108. http://mcgovern.library.tmc.edu/data/www/html/people/osler/PPM4th/OP400067.htm. ^ George, Ronald B. (2005). Chest medicine : essentials of pulmonary and critical care medicine (5th ed.). Philadelphia, PA: Lippincott Williams & Wilkins. pp. 353. ISBN 9780781752732. https://books.google.com/books?id=ZzlX2zJMbdgC&pg=PA353. ^ a b Eddy, Orin (Dec 2005). “Community-Acquired Pneumonia: From Common Pathogens To Emerging Resistance”. Emergency Medicine Practice 7 (12). https://www.ebmedicine.net/topics.php?paction=showTopic&topic_id=118. ^ a b Nair, GB; Niederman, MS (November 2011). 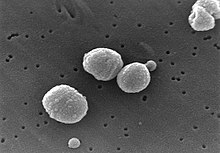 “Community-acquired pneumonia: an unfinished battle”. The Medical clinics of North America 95 (6): 1143–61. doi:10.1016/j.mcna.2011.08.007. PMID 22032432. ^ “Pneumonia - management in the developing world”. Paediatric Respiratory Reviews 12 (1): 52–9. (March 2011). doi:10.1016/j.prrv.2010.09.011. PMID 21172676. ^ “Global, regional, and national causes of child mortality: an updated systematic analysis for 2010 with time trends since 2000”. Lancet 379 (9832): 2151–61. (June 2012). doi:10.1016/S0140-6736(12)60560-1. PMID 22579125. ^ “Epidemiology and etiology of childhood pneumonia”. Bulletin of the World Health Organization 86 (5): 408–16. (May 2008). doi:10.2471/BLT.07.048769. PMC: 2647437. PMID 18545744. https://www.ncbi.nlm.nih.gov/pmc/articles/PMC2647437/. ^ “The magnitude of mortality from acute respiratory infections in children under 5 years in developing countries”. World Health Statistics Quarterly. Rapport Trimestriel De Statistiques Sanitaires Mondiales 45 (2-3): 180–91. (1992). PMID 1462653. ^ “Pneumococcal vaccines. WHO position paper”. Releve Epidemiologique Hebdomadaire 74 (23): 177–83. (June 1999). PMID 10437429. ^ a b Sharma, S; Maycher, B; Eschun, G (May 2007). 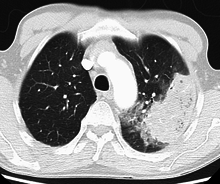 “Radiological imaging in pneumonia: recent innovations”. Current Opinion in Pulmonary Medicine 13 (3): 159–69. doi:10.1097/MCP.0b013e3280f3bff4. PMID 17414122. ^ Anevlavis S; Bouros D (February 2010). “Community acquired bacterial pneumonia”. Expert Opin Pharmacother 11 (3): 361–74. doi:10.1517/14656560903508770. PMID 20085502. ^ a b Murray and Nadel (2010). Chapter 31. ^ Figueiredo LT (September 2009). “Viral pneumonia: epidemiological, clinical, pathophysiological, and therapeutic aspects”. J Bras Pneumol 35 (9): 899–906. doi:10.1590/S1806-37132009000900012. PMID 19820817. ^ a b Behera, D. (2010). Textbook of pulmonary medicine (2nd ed.). New Delhi: Jaypee Brothers Medical Pub.. pp. 391–394. ISBN 8184487495. https://books.google.com/books?id=0TbJjd9eTp0C&pg=PA391. ^ Tintinalli, Judith E. (2010). Emergency Medicine: A Comprehensive Study Guide (Emergency Medicine (Tintinalli)). New York: McGraw-Hill Companies. pp. 480. ISBN 0-07-148480-9. ^ Shah, Vaishali P.; Tunik, Michael G.; Tsung, James W. (2013). “Prospective Evaluation of Point-of-Care Ultrasonography for the Diagnosis of Pneumonia in Children and Young Adults”. JAMA Pediatrics 167 (2): 119. doi:10.1001/2013.jamapediatrics.107. ISSN 2168-6203. ^ Darge, Kassa; Chen, Aaron (2013). “Ultrasonography of the Lungs and Pleurae for the Diagnosis of Pneumonia in Children”. JAMA Pediatrics 167 (2): 187. doi:10.1001/2013.jamapediatrics.409. ISSN 2168-6203.